No one wants to enjoy a landscaped yard just through a house window. You want to be outside in your outdoor “room”, not inside looking out at it, right? If so, you probably don’t want to be stepping on dirt or mud. You need solid flooring for your outside rooms and connecting pathways. That’s where patios, walkways, and steps come in. They’re the foundation for enjoying your outdoor room by yourself and with others. Having a paver patio or stone patio is an automatic assumption for upscale landscapes. You need at least one—and maybe several strategically placed around your home—to serve as a base from which to enjoy your closest outdoor environment. A natural bluestone patio is an ideal location for family and friends to gather outdoors. They can enjoy fresh air, the sound of birdsongs, and the invigorating scent of flowers, grass, and other growing things. Walkways provide convenient passage between outdoor areas and add visual interest to your landscape. Like patios, outdoor walkways can take many forms. A simple concrete sidewalk between point A and B. Garden pathways can wind their way through your yard and reveal a secret hideaway or other landscape feature. Paver and stone pathways can vary from plain to phenomenal; what kind of ambiance you want to create in your outdoor “hallways” is up to you. If you want fanfare, however, consider a stone or paver walkway. Thick catalogs are needed to show the variety of sizes, colors, shapes, and materials stone and pavers are available in. Depending on the topology of your yard, you may need stairs to help you and your companions move from the house to the outdoors and between different levels in your yard. Depending on the height difference, you might need only a step or two between levels. With large differences you might want multiple stairs with a small, or large, patio as a landing for weary legs to rest on. As with patios and outdoor walkways, steps and stairs can be made with a wide assortment of materials. Want some ideas for how your outdoor flooring might look? Wander through our gallery of patio, walkway, and steps to see some of the work we’ve done for your neighbors in the community. Want to learn more about the options for hardscape flooring? See our Stone and Paver page to see the variety of options available and their pros and cons. If you want more information, or are ready to get your landscape project started, contact Horizon Landscape today for help. 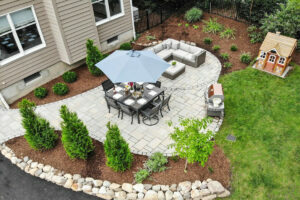 We have met and exceeded our clients’ landscaping expectations in Wyckoff and surrounding areas for more than 40 years. Let us use our local knowledge and experience to satisfy your landscaping desires.